Button, antique gold-plated pewter (tin-based alloy), 15x13mm curved flat oval with swirl design and beaded edge with textured back. Sold per pkg of 2. These antique gold-plated buttons feature crisp casting and attractive details. They have lots of applications in creative jewelry designs and fabric and clothing embellishment. These attractive components make eye-catching additions to resale lines. 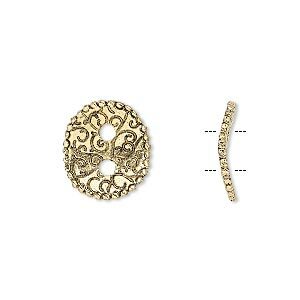 Button, antique gold-plated pewter (tin-based alloy), 15x13mm textured curved flat oval. Sold per pkg of 2. Button, antique silver-plated pewter (tin-based alloy), 15x13mm curved flat oval with swirl design and beaded edge with textured back. Sold per pkg of 2. Button, antique silver-plated pewter (tin-based alloy), 15x13mm textured curved flat oval. Sold per pkg of 2. Button, Czech glass and brass, iridescent sapphire blue and gold, 31mm round with dragonfly design. Sold individually.